1826: 26 August born at Stokes Bay, near Alverstoke and Gosport, Hampshire, England (1). 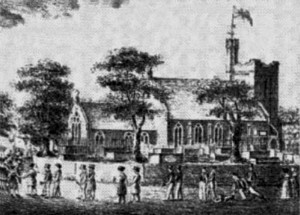 1826: 17 September baptised at St. Mary’s Church, Alverstoke (2). 1841: Residing at Stokes Bay, Alverstoke with parents Samuel (a publican), Jane and siblings. 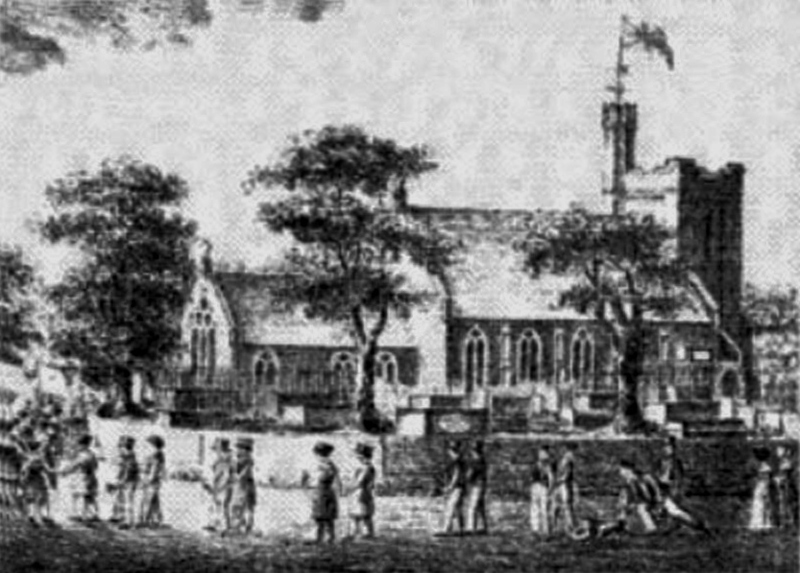 Charles recorded as a carpenter, aged 15 (3). 1841-1851: Date unknown – enlisted in the Corps Royal Sappers and Miners. 1851: Quartered at the royal palace Kensington with other soldiers of the RSM (4). 1858: 1 January arrived at Fremantle on Nile with 26 other sappers of the 20th Company RSM. His trade was recorded as carpenter (5). He would have used these trade skills for his role as Instructing Warder for the Convict Establishment. 1861: Recorded on Muster in Western Australia as Service #2318 (6). 1861: 30 December, Perth discharged from Army (7). 1862: Married Mary Bond in Perth. Charles and Mary had four children. Caroline 1862, Perth, WA. Ann Maria 1866, Beverley, WA. Owen 1868, Collie, WA. Frank 1871, Capel, WA. Mary Burton nee Bond died 1872 age 32 (8). 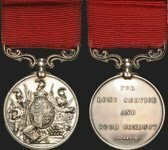 1864: 23 June, appointed Assistant Warder in the Convict Establishment. He was sent to Toodyay by steamer arriving 2 July to be in charge of work parties (9). 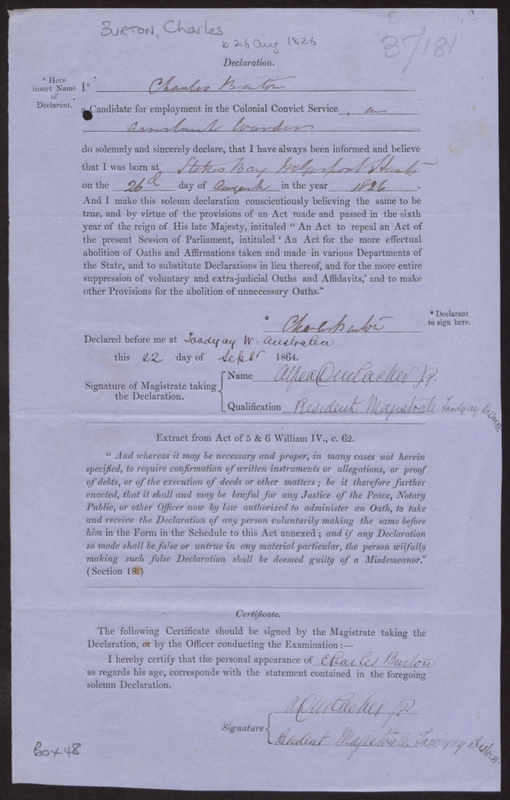 While in Toodyay, the Resident Magistrate, Arthur Durlacher JP, signed the civil service declaration of Charles’ birth date and place (22 Sep 1864) (1). 1865: Sent to Beverley to work on bridges. The Clerk of Works stated “has completed bridge over the Dale and approach roads in a most satisfactory manner ….. deserves great praise for his attention and perserverence in pushing the work to completion” (3 Sep 1865) (9). 1865-1871: Moved from Beverley – Perth – Fremantle – Bunbury – Collie – Preston River – Capel, escorting prisoners and building bridges (9). 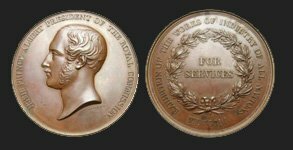 1870: Requested a reward for his services in bridge building. He was promoted to Warder but without gratuity (9). 1872: 8 September suspended and dismissed after being found drunk on duty (9). 1872: 9 October reappointed. Moved from Bunbury to Fremantle with family (9). 1874: 15 January took charge of Freshwater Bay Depot. 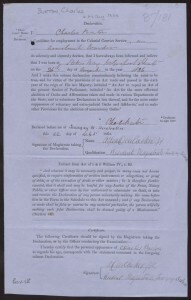 Reported by Resident Magistrate Fremantle for frequent absence from camp and being drunk (9). 1874: 20 March dismissed (9). 1876: Married Ann Gee nee Nichols, widow, in Perth (8, 10). 1902: 30 June died at 625 Hay Street West, Perth (11). Buried at Karrakatta Cemetery, Anglican Gravesite No. BA 0199 (12). 1. Civil Service Examination of Age, 1862 [Civil Service Commission records]. 2. Hampshire Parish Baptisms [County Record Office, Hampshire]. 3. 1841 Census of England & Wales [HO107-388-3-15-1]. 5. Muster Rolls & Pay Lists January 1858 [WO11-158]. 6. Muster Rolls & Pay Lists June Quarter 1861 [WO11-191]. 7. Muster Rolls & Pay Lists December Quarter 1861 [WO11-199]. Order signed by F P Barlee [CSR Vol. 449-15]. 8. WA Birth, Marriage & Death Indexes. 9. Dictionary of Warders & Gaolers p.28-29, David J Barker. 10. Bicentennial Dictionaries Vol. 1, p. 410, Rica Erickson. 11. Daily News Funeral Notice 30 Jun 1902. 12. Metropolitan Cemeteries Board records.